What makes a top team? What makes some teams super successful while others work hard yet don’t produce the results they want? What creates a disheartening team culture? The top teams I work with invariably align three key elements; vision, results and right relationships. See diagram. By right relationships I mean teams which ensure both their internal connections and their stakeholder relationships are fit for purpose. Many teams have two of these three elements – the secret to success is in aligning all three. 1. Teams with a clear vision and key success factors produce an unforgiving group culture. There is lit tle appreciation or vitality amongst team members resulting in the people feeling their work isn’t valued. 2. Teams focused on vision and ensuring the right relationships are likely to flourish in a truly feel-good culture.People love working in these teams and are inspired by both their purpose and one another. They have great discussions, however there is little action and few results are produced. 3. Where leaders emphasise right relationships and results, a productive team results, however the environment is chaotic, with constant shifts in direction and priorities. Team members’ receive littledirection from the leader. This team is typically hard working yet without a vision, the people are easily exhausted. 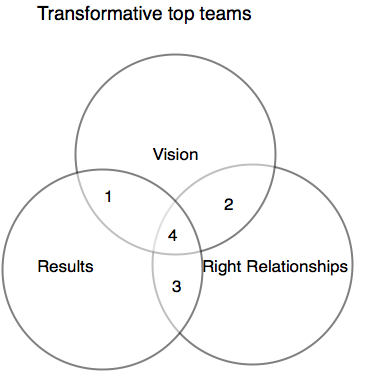 In 4, teams aligning vision, right relationships and results, are transformative . These team have clear direction, produce exceptional results and create a satisfying productive culture. What are you doing to ensure your team is inspired with a clear vision, producing results and the right relationships? Where is your attention in ensuring your team is transformative and really making a difference to clients, one another and the world?